Spotlight on DL Richardson, part 2. Welcome to the Apocalypse 1: Pandora. Book One: The Apocalypse Games is a state of the art virtual game designed to entertain doomsday preppers, gamers, and cosplayers. But not everyone is here to play the game the way the creators intended. Some players don’t belong at all and some are there just to escape reality. Whatever the reason, over 100 people enter simulation pods and hook up to the computer with one goal: survive 24 hours of an apocalypse. Instead of game over at the end, they’re plugged straight into a new game. Then another. It’s clear the computer has malfunctioned. What’s not clear is why. Kelly Lawrence is a grieving widow. Jack Minnow is a website designer. Reis Anderson is the son of a senator. Each of these players has their own reasons for signing up to The Apocalypse Games, a state of the art virtual game designed to entertain doomsday preppers, gamers, and cosplayers. Altogether, over 100 people enter NASA designed simulation pods and hook up to the mainframe computer with one goal: survive 24 hours of an apocalypse. Instead of game over at the end, they’re plugged straight into a new game. Then another. It’s clear the computer has malfunctioned. What’s not clear is why. With no communication to or from the outside operators, they can only fight endless battles and hope they’re rescued before it’s too late. While they can’t die inside the game, they can die if the pods break down while they’re still hooked up. This game of survival just got real. D L Richardson is an author of paranormal books for teens, and author of apocalyptic and dystopian sci-fi books for adults. Lover of coffee, music, and animals. Lives in Australia with her husband and dog. WELCOME TO THE APOCALYPSE – PANDORA avail now: for fans of Robopocalypse, The Hunger Games, Ready Player One, World War Z. D L Richardson is a writer of speculative fiction, with reviews such as “exciting and fast-paced book with an original story line–Buzzwords Books”, “I really enjoyed the twists and turns of this YA novel–Night Owl Reviews” and “This was a marvelous book–Lit Pick Reviews”. She conducts workshops at writers centres and has appeared on panels at Conflux 2015. She recently held a mentor a role at a writer weekend retreat. Writing credentials include “Writing Feature Articles for Newspaper and Magazines” Sydney Writers Centre, “Writing for Children and Young Adults” Sydney Writers Centre, and “James Patterson Teaches Writing” Masterclass. Her published books can be found on her website http://www.dlrichardson.com. When she’s not writing, she can be found wandering in her yard waging war on weeds, watching back-to-back episodes on Netflix, playing her piano or guitar, curled up on the couch reading a book, or walking the dog. January 2, 2107 is National Science Fiction Day. You can’t be blamed for not knowing this since it isn’t an official holiday, it’s a day that group of sci-fi fans declared as THEIR day. Fans celebrate National Science Fiction Day by reading books and watching movies. Dressing up as their favourite character is optional. I say that we should declare this day as INTERNATIONAL Science Fiction Day. We are nerds and we are global. A lot of us are women, too. Women write sci-fi books, we read them, we act in sci-fi movies and TV shows, heck we even write the scripts and screen plays. We are characters in science fiction stories; some of us are rebellion leaders, some of us are star ship captains, some of us grace the covers of comic books in metal bikinis and short shorts. Feminist science fiction writer and critic Joanna Russ has famously stated that there are “no real women” in science fiction, only images of them, since so many women characters are based purely on male fantasy. So when it came to writing my science fiction book “Welcome to the Apocalypse”, obviously I had to write a female version of a woman. Kelly Lawrence is grieving the loss of her husband and this grief takes her into an environment she’d never ordinarily venture into. She signs up to The Apocalypse Games and when the mainframe malfunctions she’s trapped in this virtual world with other players. Now, if I was writing this book with only the male reader in mind, I would have written her as a flame-thrower-toting, cigar-smoking, cleavage-jutting, cuss-word-using woman with flowing red hair and anime eyes. She’d be a bit player who propped the ego of the male characters and was sexualised. But I wrote about a woman who didn’t ask the male characters in the book to follow her in to the game. She didn’t ask the male characters in the book to stop what they were doing and help her. She didn’t run around in high heels portraying the damsel in distress. She’s just a woman faced with a problem to solve. In a September article written for the ABC titled “Science Fiction’s Women Problem”, (link here http://www.abc.net.au/news/2016-09-16/science-fictions-women-problem/7851672) it lists alarming figures about sexism in the sci-fi industry. In May 2016, the books reviewed in Analog and Asimov (ironically, national sci-fi day is accredited as being the date of Asimov’s birthday) the number of books reviewed that were written by women was 22 per cent, while the number of reviews written by women was 0 per cent. Did they not invite women to review these sci-fi books? Was the science fiction too difficult for us to grasp? Even with the odds stacked against female writers who delve into the science fiction genre, I say bring it on! I have two sci-fi series that I’m currently working on, and my female characters – whether major or minor roles – will be real women. I hope you’ll enjoy reading my books. 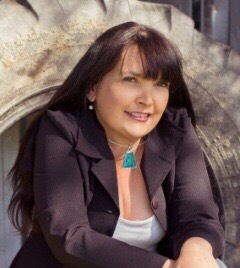 D L Richardson is an author of paranormal books for teens, and author of apocalyptic and dystopian sci-fi books for adults. A lover of coffee, music, and animals, she lives in Australia with her husband and dog. WELCOME TO THE APOCALYPSE – PANDORA is avail now: for fans of Robopocalypse, The Hunger Games, Ready Player One, World War Z.